Thank you, Knitti-me for your request to see something done in Opal the colour that I suggested most resembled a seashell for the Venus Vest pattern. 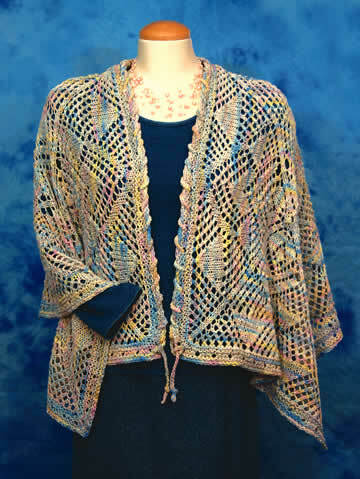 Kaleidoscope Wrap is knit in Opal. The soft peach tones melt into beiges and creams with hints of pink and blue. The dyer has tried to capture that gorgeous pearlescence that we see when we turn over a seashell after its occupant, the chambered nautilus, has left. Hope you like it! Of course, I couldn't leave you with out a look at Debbie New's take on seashells. Here is her card entitled "Renaissance". Again the rigid form of the seashell made soft by the knitting, surrounds a knitted bather - perhaps Venus resting. Everything is so serene; but underneath there is a lot of activity. Debbie was experimenting with certain mathematical formulae - fractuals - in her development of the spiral shape of the shell. Debbie decided to knit her shells as they grew. They are, says Debbie in "Unexpected Knitting", self-similar shapes that retain their form as they grow. Perhaps there is a lot of activity going on in the mind of the bather too. Debbie's cards are available from Philosopher's Wool. Finally, I could not finish without a mention of The Chambered Nautilus by Oliver Wendell Holmes. Again, there is a lot going on. Shells are amazing structures. I think that a knitted beach bag in the shape of one might be very interesting. --Its irised ceiling rent, its sunless crypt unsealed! As the swift seasons roll!Leave thy low-vaulted past!